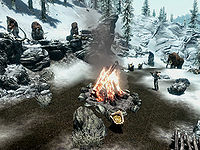 Tumble Arch Pass is a giant camp located east of Korvanjund and due north of Shearpoint. It is home to a single giant and mammoth. Surrounding the camp are the typical painted rocks, and many mammoth ribs and skulls. The camp has a large fire, and a pile of firewood with a dead deer beside it. There is one mammoth cheese bowl beside the fire and three more to the west. Southeast of the fire, against some rocks, is an unlocked wooden chest. Above the camp on the rocks to the south is a large stone bowl containing three sprigs of snowberries and a giant club (see notes). The giant club can be picked up by a follower, however they are unable to use or drop it once taken and it will count towards their maximum carry weight limit. If this giant is killed prior to being given the quest by Jarl Skald, the quest may be uncompletable. ? This page was last modified on 28 September 2015, at 08:57.